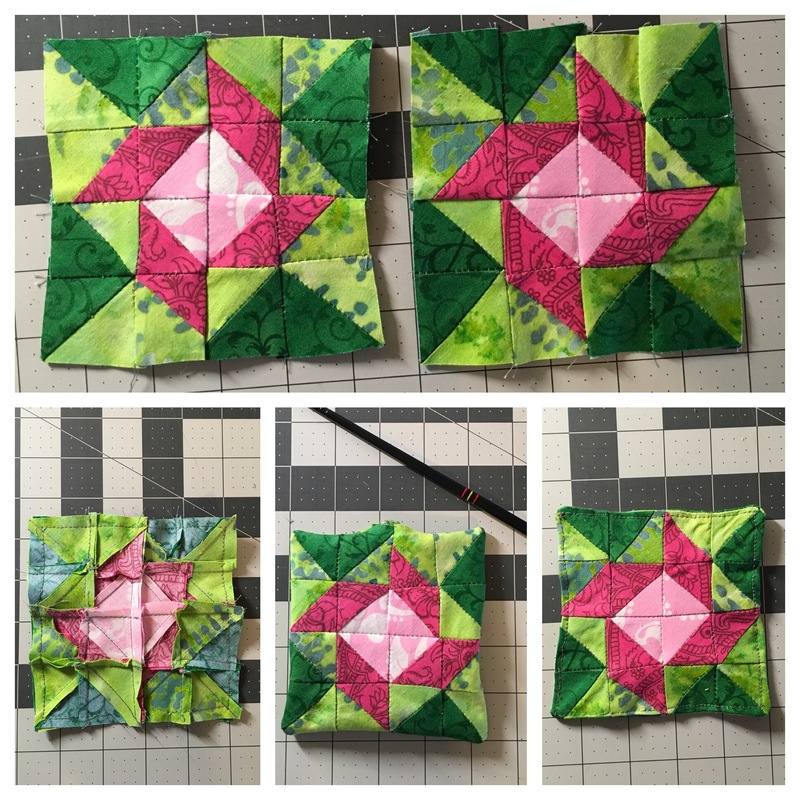 I’ve seen Pins about Quilted Coasters but I’ve never taken the time to give them a try. I was looking at having a few coasters at work so I decided today’s the day! The only issue I’ve had is the tension on my bobbin seems to be off and gave me a lot of issues, so before I make another one that will need to be fixed! I opted not to put any batting or anything else in the middle because I was afraid it might get too thick and not work as well. I will test them out at work first to see how well they work before making more. 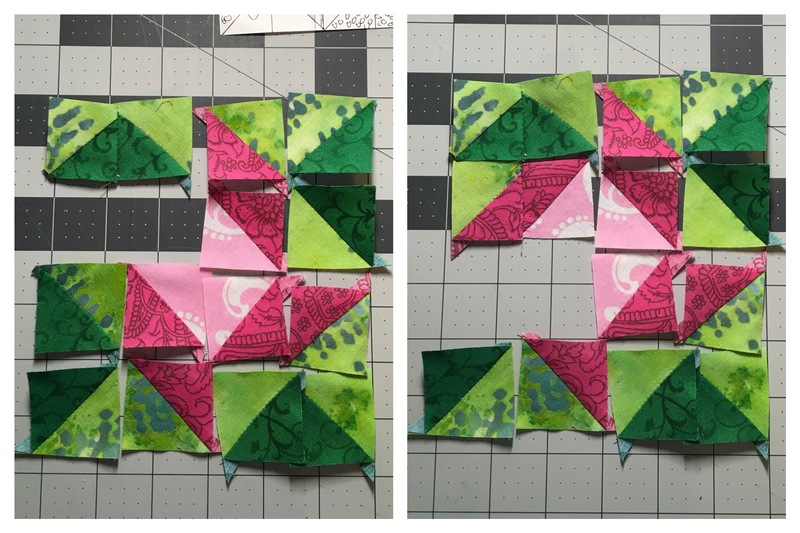 I found a really pretty design with all triangles and decided it was time to start having fun with different triangle patterns. I drew out the pattern and mapped out what I would need. I made both sides the same pattern, so I doubled what’s in the note. For the coaster I also wanted each finished square to be 1 in x 1 in, so I wanted 1 1/2 inch squares to sew together. I didn’t want to cut and sew so many tiny pieces so I went for the most productive way to generate many quickly. 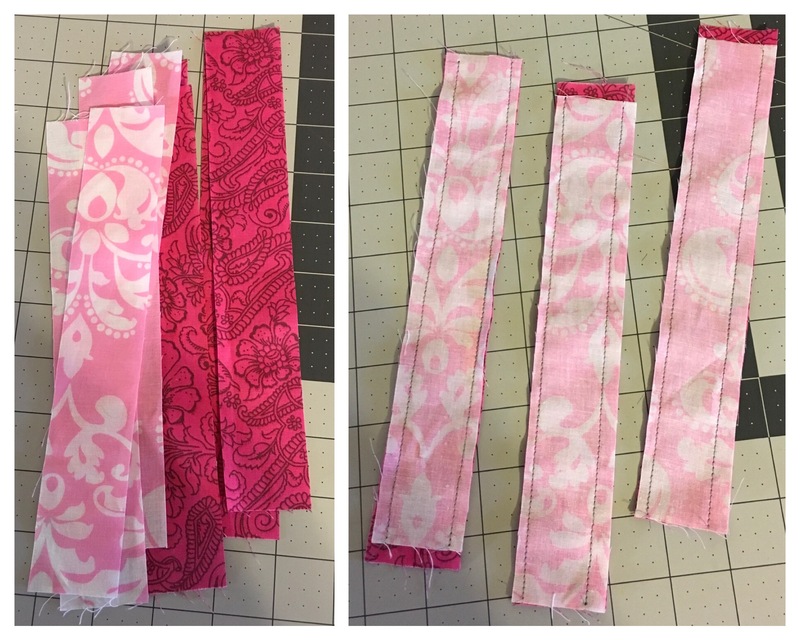 I cut 1 1/2 inch strips of the fabric and sewed the two different colors together (right side facing inside), sew along both ends of the strips. Take one strip and lay it on the cutting board and use the 45 degree angle to cut the triangles. First you will need to trim the end, make sure to line up the 45 degree line with the stitching at the top. Then change the rule around so you have a triangle, again lining up the 45 degree line with the stitching at the top. 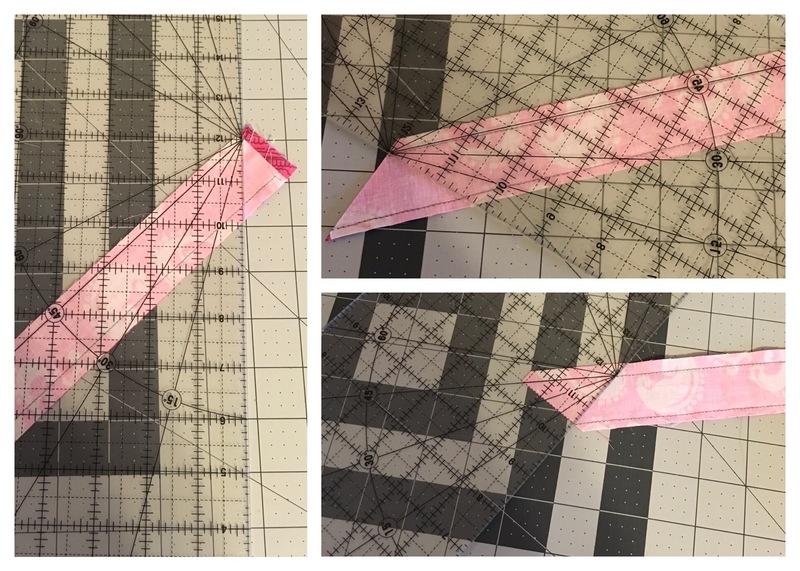 Repeate until you have used up as many triangles as possible with the strip. 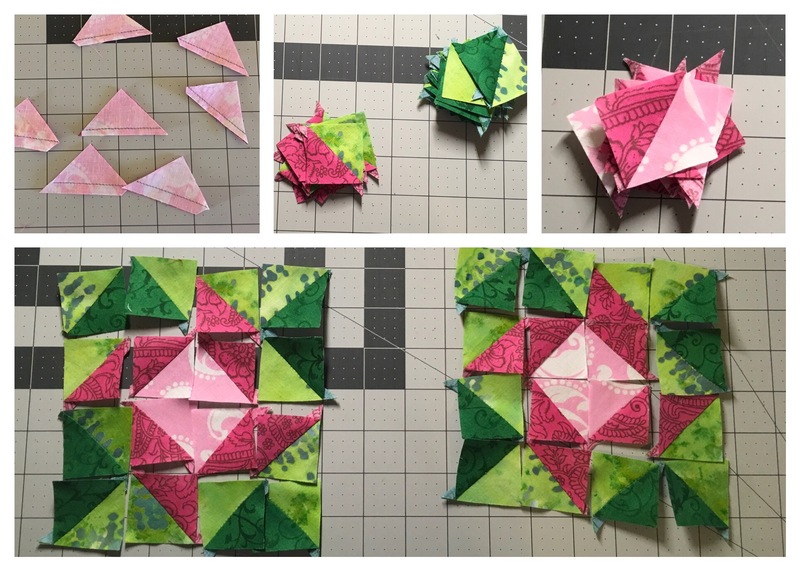 It’s hard to say how many triangles per strip because I was using scrap and they were all different sizes. Iron each piece into squares then lay out the pieces out in the pattern you want, make sure to do this with both the front and back of the coasters. I didn’t want to accidentally sew the wrong sides together so this worked great when there was a lot going on in the house (and I took a lunch break before finishing). Take two pieces totgether at a time and sew. I started at the top left on one block, then the top left on the next. By taking one at a time it allows me to have a hole and easily remember where the other piece went. After sewing the two pieces together I also trimmed the ends that were outside of the square, to make the entire piece square/rectangle (not shown below, I started doing that after I took pics). After sewing two pieces together into a rectangle, I sewed the next top two pieces into squares. Then I kept picking pieces to sew together until the block was completed. This was rushed, and I had some serious tension issues that I was trying to work around, so they are not exactly perfectly square. That’s what I like about home made things, they are all unique and each typically have some type of “flaw”. Take the two pieces and place them nice fabric facing nice fabric, trim any pieces sections that are not lining up nicely. I also flipped it over and trimmed any additional pieces that were outside the bounds. Sew along the edge leaving about an inch to turn it right side out, I always prefer to leave the hole in the middle of a straight edge. Turn it right side out, and use a chopstick (or something similar) to get the corners crisp. Iron the sides flat, I pressed as hard as I could and steamed it a few times. Make sure to iron the opening folded over so you can sew along it easily. Sew along the outside and your done! I actually really like these! It turned out really nice with the exception of my tension issues. I can’t wait to get the tension fixed so I can make more! I’ve decided that I want to make a few for home as well. We have sand stone coasters and sometimes the glasses sweat and stick to them, so we will see how well these work!